As the lilacs fade, the first peonies begin to bloom in my garden. Welcome to Garden Bloggers' Bloom Day for May 2009. Though summer seems not too far off, the garden in the middle of May still has a fresh feeling to it here in USDA hardiness zone 5b. The mornings are still cool, and the weeds seem easy to pull after more than enough rainfall in April and now May. I measured over two inches of rain just yesterday. But in spite of the rain, we've had enough sunny days that blooms are opening as fast as I can notice them. Clematis 'Pink Fantasy', newly planted late last summer, just started blooming a few days ago, and now greets visitors as they come up the front walk. I hope it continues to bloom throughout the summer. 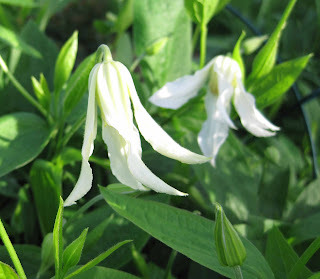 In the back garden, the shrub clematis, Clematis integrifolia ‘Alba’ has also just started to bloom. It's never been so full and fresh as it is this year. Must be all that rain! Nearby, the blue flowering C. integrifolia 'Rooguchi' is still too small to bloom but I'm happy it came back this spring since I didn't give it the best care after I planted it last summer. I started these from seed years ago and they've come back reliably every year. They even self sow themselves a bit, coming true from seed. For that reason, I have them scattered throughout the garden. 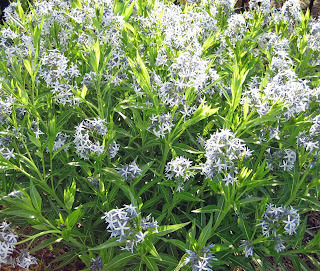 Another blue flower of spring is the Blue Dogbane, Amsonia tabernaemontana. It only blooms for a few weeks, but then it stays about three feet tall and three feet wide and is a good backdrop for other flowers. It does self sow a bit so I think I'm going to start cutting off the seed heads before they mature. Out in the front garden, this slow growing vine, Woodbine Variegated Honeysuckle Vine, Lonicera periclymenum ‘Harlequin’, is blooming, but the bloom gets lost in the foliage. That's okay, I bought it for the foliage. I bought these Deutzia shrubs last year because I had to pull out some ivy choked Deutzia the fall before and I missed their white blooms. This one is Deutzia gracilis 'Duncan', sold by Proven Winners as 'Chardonnay Pearls'. I still think more gardeners should plant Deutzia in their gardens. Finally, out in the vegetable garden, the 'Snowbird' peas are starting to bloom. And I see blooms on the strawberries and grapes, and tiny apples forming on the lone apple tree. What's blooming in your garden this month of May? We'd love to have you share your blooms with us on the 15th of each month by joining us with your own Garden Bloggers' Bloom Day post. Just post on your blog about what is blooming this month in your garden and then come back here and leave a link to your blog post in the Mr. Linky widget below along with a brief comment to let us know you've posted. The rules are simple... no rules! You can include pictures, lists, no lists, common names, botanical names, whatever you’d like to do to showcase your blooms. All are welcome! Hi Carol - I feel like I'm cheating a bit putting this up at 9pm PST on the 14th, but tomorrow I'm probably not even going to turn on the computer. My definite must-have plant (I seem to add one every month you do this hosting thing) for next spring is columbines. I grew up with so many in my mom's garden, but this one has none. I keep forgetting to do the seeds, since you have to cold stratify them, right? I might be too lazy for that, but maybe next year I'll mend my ways. Happy May, your favorite lovely blooming month, right?! May 2008 is when I started and I have really enjoyed making the GBBD posts this past year.Thank you so much for giving us this platform to show our best plants. Everything is coming up roses in my garden right now. Luckily there are finally some raindrops on the outdoor. Finally, I'm getting to post again for GBBD and I'm not even late this time! I was glad for a break in the rain to get outside today and take pictures today! I was wondering at first how you had so much in bloom, then I saw that you had been plant shopping! I planted some mallow last year and it's coming up all over that flower bed. I've heard good things about the Deutzia, too. I'm like Karen, in the Mtn time zone, so posting at 10 p.m. here, midnight where you are! Carol — your May Dreams seem to be reaching fulfillment judging by the images of your garden. I am the opposite of you: woodland peonies are ending just as lilacs are about to begin. Lots happening here — at last! Thanks in advance for what I know will be a great day of visiting gardeners and gardens online! I love your dogbane - so dainty! I finally managed to catch a bloom day! Congratulations on all the blooms, your garden looks gorgeous. Your garden looks so light and pretty. 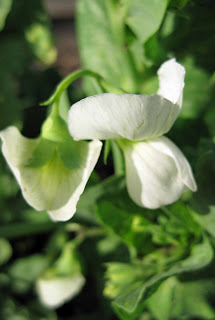 I love the pea flowers! I love the columbine. It looks like the picture of spring. You must spend hours in the garden. It's always a delight to visit your garden. Oh, does this mean we Southerners will miss seeing lilacs in bloom in Chicago in a couple of weeks? I was counting on it. Harlequin is STUNNING, Carol. Your garden is looking lovely. I'm so thrilled to be participating in my very first GBBD. For many, looking at my blooms will be like looking in their own gardens weeks ago. Our season is very slow to get started, so some spring things that many gardeners have said goodbye to are just peaking. But I found a lovely surprise in the woods. Have a great GBBD, everyone! Thank you so much Carol. I love your Clematis, but then I'm a Clematis fan! My McKanna hybrid aquilegias are a different colour to yours - a snazzy yellow/red combination, plus a lovely mauve. Their extra large flowers are stunning aren't they? Enjoy your blooms day everyone! You have very similar flowers blooming to me at the moment. I havent come across the Blue Dogblane before so will go and check that one out. Hi Carol, reading about your garden is always wonderful. I love your peonies and clematis. More so, because I can't grow them in our climate. But it's always good to see/read about blooms you've never seen. I still get to 'enjoy' them. Happy GBBD to you. Nice clematis. Thanks for hosting. There are some nice blooms out there. I too admire your peonies and clematis, Carol - particularly that pretty pink clem. No, don't worry about regretting the Callirhoe; for me, at least, it's not a rampant self-sower. And anyway, it has such a nice way of weaving around its partners without overwhelming them, I don't think you can have too much. My post is up at Hayefield this month. Happy Bloom Day to all! The double columbines are beautiful together. I don't have any in my garden but each time I see them I ask myself why. I think I may need to make a stop at my local nursery and pick up at least one today. I haven't blogged in a couple of months, and thought today was a perfect day to try again. Love the Roses and Clematis, always a favourite. Carol, your clematis are gorgeous! Mine haven't bloomed yet but spring has started in Maine. I am finally able to participate with blooms from my garden. I'm hoping for help in identifying a couple of mystery blooms. So far I've had several different guesses. Thanks for hosting GBBD. Good morning Carol, wow there are already so many on Mister Linky and it is not even 7 AM! This promises to be a huge turnout. I wanted to comment on Tiny Rubies, for I also grow that little one, and the flowers are pink, not even dark pink, so why the rubies name? She asks politely. Thanks for showing your new purchases too, I have also made a list, seperate from the journal entries where these were recorded before. It is shocking how many, we are already on the third page. She says with embarassment. Beautiful blooms Carol! That's quite a list of new additions to your garden. My, you've been busy! While the common Lilacs will probably be done blooming here in Chicagoland by Spring Fling, there's a good chance at least the Miss Kim Lilacs will still be blooming. You're close to having made a convert to the fans of Deutzia. 'Duncan' is quite the eye-catcher. I'm going to see if there's anyplace for him here. Hi, Carol, Your photos are gorgeous. Thank you for including everyone in your wonderful bloom day. I've been blogging on my newspaper's site but have branched out on my own now too. This is my first GBBD at my new site. I like that pink Clematis as well, even though I am not a pink person, it reminds me of one of the new Poinsettias. I rescued a Chardonay Pearls for the back garden only to have it trampled nearly to death by one of the dogs, now it is surrounded by lots of stakes to discourage paw damage. May is looking marvelous at May Dreams Garden. In my own garden I am worrying about influenza and global warming. Thank you once again for hosting. I love the aquilegia! I can't believe it's mid-May already. The spring is flying by. It is always surprising to me how different the blooms are in the same zone, but in different parts of the country. A reminder that hardiness zone doesn't explain everything. My lilacs on our Massachusetts hill are just starting! I probably won't even have many roses in bloom on June 15. Thank you Carol for Bloom Day! You are "in the pink" at Maydreams. I haven't seen peonies since I was a child, in Grandma's garden. The ants would always be there to open the buds- or so they said. 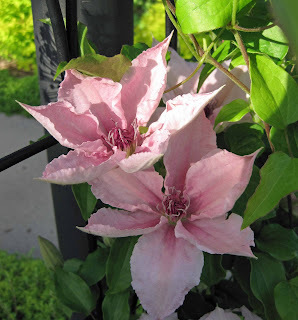 ALso your pretty pink clematis-Will it really bloom all summer- ours have such a short season. It's wonderful to see all your pretty blooms. Thanks for hosting bloom day. I love your Clematis. I bet they love it up there in Indiana. I'm encouraged to see you have a pea flower! It seems like mine will never get here. Thanks for hosting GBBD again. Hi Carol, you've planted quite a nice collection of new plants this spring. I love your Clematis 'Pink Fantasy', what a nice way to greet visitors. I'm always looking for more shrubs to add and Deutzia 'Chardonnay Pearls' is wonderful. I'm always amazed when I see you zone 5 gardeners so far ahead of me in blooms. I'm in zone 6, but have a maritime climate so we tend not to get the really warm weather as quickly in the spring. Carol, I love that new clematis "Pink Fantasy"; I'm going to have to look for that one! We've had lots of rain, too, and while I don't appreciate not being able to get much work done in the garden, the garden is loving all the rain and growing like crazy. Very nice Carol! I'm reminded every year about peonies when they bloom but I always forget to get one. I'm glad to see you picked up a 'May Night' salvia, you can't go wrong with a salvia! Beautiful! I'm so jealous of the amazing new plants you were able to add. Thanks for posting all of the information about them too! My amsonia is one of my favorites! You have peonies already? It's amazing what moving a few miles southeast will do. My garden is full of green and flowers this month and I can't look at it enough after the long winter. Almost forgot to come back and comment when I dived right into the May Gardens! Thank you for hosting once again. I went back and changed my format to ONE post loading for now, so my page would load quickly, I hope. I notice that I'm not the only one who used collage so as to limit the scroll-down. Just gorgeous! This IS my favorite time of year! I love all of your clematis, I can't wait to see some of mine. The double columbines are really pretty too, I like that it comes true from seed. I'm going to look for these ones. Thanks again for hosting this fun day. Carol your garden is so very lovely! The columbines, amsonia and your peony about to open! My lilacs are just peaking sad to think of them fading but seeing your peony makes me happy to think of what will be coming our way next! I can just about taste the yummy peas! Gorgeous clematis! Does it seem a bit early for the peonies to be blooming? I usually don't expect them until Memorial Day. Hope your week in the garden has been wonderful! Carol -- Love the clematis. And I've been thinking about Deutzia for some time now. Love the charteuse leaves on yours. Hello. This is my first Bloom Day post and hopefully not my last! We have a small house in South Bend (Indiana) as well as our main home here in the North Carolina Piedmont so it's interesting to me to see what is happening up there! This is also my first Bloom Day post. Thanks for hosting! I love seeing what all the plants are up to! Despite all the rain here, there are actually still blooms in the garden! I haven't done a GBBD in ages and am glad to be back. Just to think, this time last month, many of us were still getting snow... And now look at the beautiful Spring flowers! Yey! Spring is here for sure when those gorgeous peonies open up. I feel late and lazy! But I have lots of blooms! Happy Bloom Day! That's some list of new plants Carol!!! As a former nursery owner, and on behalf of entire industry - THANK YOU. As only a cranky gardener can, I continue to complain about our cold spring here in the PNW. I try and tell myself to enjoy the bloom display that's starting to back up on itself as plants that have been late to bloom overlap those whose bloom is triggered by day length. And it's all lasting so very long due to our "floral cooler-like temperatures"...but, I'd still rather have some warmth. Maybe next month! Thank you for hosting bloom day. It is my first. My gosh, what a job you have. Very nicely done. A very short list of blooms from Northwest Montana :) Love that you are doing this . . . look forward to reading. You're two weeks ahead of us here in Chicago, Carol. With all the rain and warm weather things are sure popping. Glad to see you've got the Knockout Roses. They're the best and I know you'll love them. Lots of beautiful bloom in your dream May garden. I love that Clematis! I've never seen such a frilly one, I've got a deep purple and a blushing purple one...Awesome! Thank you again Carol for inspiring us all to celebrate blooms! 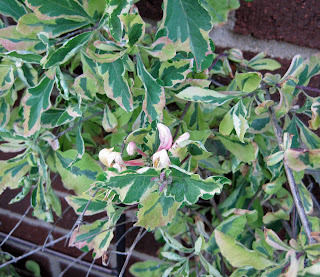 The pink Clematis is nice, but I'm most fascinated by the variegation on the honeysuckle. And "slow-growing", you say? I'm working too hard lately and hardly have time to look at my own flowers, but I'll enjoy minibreaks with at least some the wonderful bloom day posts here! Gorgeous, Carol, as always, thank you. Lilacs and peonies and clematis. Long sigh. Reading GBBD posts this time of year just makes me want to get out of Texas as quickly as possible and get to somewhere moist, green, and blooming. I'm so tired of the dry, the dusty, the mean small-flowered xeriscape plants--and summer's just starting. I think I'll spend the rest of the day visiting all the lush green, redolently flowered gardens of bloggers north. I'd be happy just to smell rich, damp loam. Beautiful blooms, love the pink Clematis. Hope you don't mind if I rejoin all of you after a few months off from GBBD. Carol, your flowers are looking lovely. All the rain has everything very green and just beginning to really bloom. Should be an interesting summer with these plants huge already. MSS@Zanthan Gardens...winter is 5 or 6 months long most years. Its all white for much of that. I love to look at the southern gardens in those months. Such pretty flowers. Don't you just love spring? Hi Carol, its great to see all your lovely blooms. But your pink Clematis deserves a special mention, it's beautiful!! 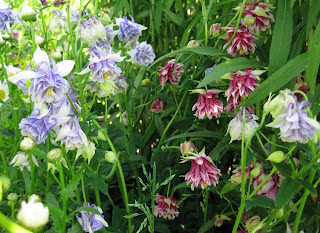 I love the columbines and the color of the clematis. Mine seem to change color every year- from dark pink now they are purple. Thank you for hosting a wonderful platform by which to share all the goodness in our gardens. It is fascinating to see what everyone has blooming. Your list of new perennials and roses is amazing. I've heard Knockout Roses are THE type of rose to have if you have trouble with blackspot (how could we not in Seattle??). I haven't tried them yet, maybe soon. It's great to see the increase in the number of your garden over just the last couple months. Wow. Spring is so cool, and your clematis are right up there with the coolest flowers! Happy May bloomday, here comes summer! Wow! What a lot of participants this month! I'll be visiting more people after I finish my work day. I just have to say, Carol, your place is looking absolutely beautiful. Thank you so much for starting this meme, which has caught on amazingly well! How do you find time to visit everyone? I have the amsonia like you do, and I really like it because it is an actual prairie wild flower and it really does perform nicely. It also gets a nice color in the fall. But you should be aware that it is not just self sowing. If you check you will find that it is also spreading underground through rhyzomes and just removing the flower heads is not going to keep it from spreading. In fact, that may encourage it to spread underground. Fortunately, it is pretty easy to pull out when it is "moving". Ahhhh--such cool, lush, different and beautiful blooms you have, Carol. I feel cooler already. I forgot how much I like peonies! The popularity of this event just grows and grows, doesn't it? We are reputed to have ideal gardening conditions here in the Pacific NW, but your garden is way ahead of mine. By the way, you talked me into planting a Deutzia. I moved away from my last one just as it was coming into its own. Thanks, as laways for hosting. Carol certainly a symphany of blossoms in your garden this Bloom Day in May! I'm posted now too..I finally am home from my winter in AZ and had marked my calender to particpate in your GBBD!Thank you for hosting! I love you different clematis. That would be a nice addition, a spring blooming vine. I'm so jealous you have peonies already. Mine are thinking about blooming, but not quite there yet. LOVE the clematis 'Pink Fantasy'. There are so many beautiful clematis out there, with so many different forms and colors, that it's hard to stop buying more and more... I wonder how many you have? Your lilacs are fading and ours haven't even opened yet. Looking at your list of Newly Purchased Perennials and Roses, makes me weak in the knees. However do you make the time for all you do? The Clematis 'Pink Fantasy' is lovely as is everything you grow. Hi carol! Long time no talk! I see you're doing well. Oh god, you should see my lawn, whenever I look at it, I think of you! I should really take a picture. Before and after haha! Anyways, the clematis pictures are lovely. Just lovely! Love your columbines! I mostly only have success with the yellow ones down here, so I enjoy seeing your pink and blue ones. My yellow ones are just finishing up blooming. Thank you for hosting GBBD. I love all your pictures and your inventory is fabulous. So different than what is going on in the Seattle area. I should do an inventory again some day. May is a busy month. I seem to be slipping further and further down the Bloom Day list for an east coast blogger. I was in the vegetable garden planting and battling slugs. You understand. Your blooms look amazing. I had to skip the blooms and watch the kids swim for the first time. Going to look at all the other bloomers linked. In just under the wire! LOL. I'm doing better, aren't I? You're a bit ahead of us up here, but it's always fun to see what we've got to look forward to. 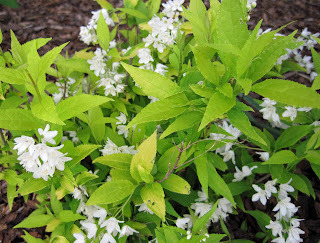 I have Deutzia 'Nikko' here and it will be blooming soon. I bought a new one from Bluestone (Rosealind) that I need to get in the ground, too. Thanks again for hosting, Carol! Thank you so much for this great chance to meet other garden bloggers - I always love seeing your garden and meeting some new folks along the way. Isn't it curious that we're both in zone 5 but you're ahead of us over there? Our lilacs have just begun their glorious show and the peonies haven't leafed out yet. I'm totally enraptured with your Pink Fantasy clematis. It's gorgeous! And that lovely peony has so many buds! Our peas aren't even in the ground yet. There's too much to do on a farm in the spring, and crops come before veggies. That's quite an impressive list of new aquisitions. You are a busy girl! Happy Bloom Day, Carol. Thanks for hosting. I'm late again, but at least I managed to post, for which I'm thankful. Didn't get pictures up, but at least got a list going. That Mister Linky thing is so cool! Lovely blooms, Carol. 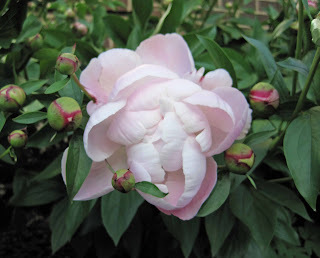 That peony photo makes me nostalgic for my grandmother's Arkansas garden. Wish I could grow a peony in Texas. Wow, we certainly are behind you. The lilacs are going strong here and as I posted, I still have lots of tulips. Love the pink clematis. Hi Carol - used Mr Linky but ran out the door before leaving a comment. Love the peony and the white clematis and you only made me miss my deutzia a little. The abelia that grows down here has something similar in the flower shape. My snap peas have flowers too, and a few edible pods so my garden is only a tiny bit ahead of you in the Pisum sativum department! Since we're already speaking Latin, just thought I'd let you know the list with botanical names is now up on Annie's Addendum. And we had an inch of rain today! The Divas of the Dirt will have to reschedule but our gardens look happier. I have two posts this year for bloom day. One is about a mystery flower I discovered up in my woods. And then there is my regular bloom day post. I'm a little late in posting for GBBD because I was out of town on the 15th, but I do like the record keeping it provides. So my post is finally up just a little late. The double columbines are gorgeous. You've got some beautiful blooms there, Carole. Gotta love spring! Carol, all of your blooms are just gorgeous! Of course, peony envy is common down here. But I was interested to see your Amsonia and hear that it self-seeds. I purchased three this year (online) and they have been sulking. I guess they may not even bloom this year?? Anyway, I will try to have patience. Love all your other blooms as well. Once again, thanks for hosting! You have such beautiful things blooming--i especially love your different clematis. Love your columbines. They look like they belong in a faerie tale. Mine aren't blooming just yet, they're buds at the moment. Lovely profusion of blooms for May, including some that I don't know at all and will have to investigate to see if they might grow in Scotland. This meme is a real delight each month - thanks so much! Better late than never...the pictures were taken on the 15th, even if they weren't posted on the 15th!